The Wrap Around Top sewing pattern: designed to be snugly form fitting and supremely comfortable, while also offering support and versatility for every body shape and size. Is it magic? We certainly think so! This pattern provides all of this with some extra extras too! This gorgeous Wrap Around is a short crop top, stopping a few centimeters under the bust. The “rest” of the top is formed by long, sweeping bands of fabric that snake around your waist and torso. Tie them as tight as you like, overlapping in a random fashion to create a sheath, tied off with bow. 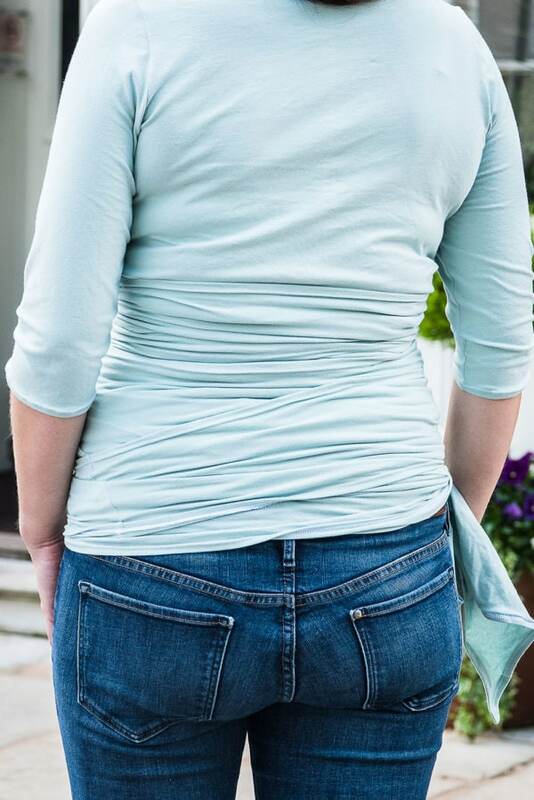 The flexibility and versatility of the long bands mean the top is suitable, and exquisitely comfortable, for maternity wear, during nursing, and every other day wear. A separate cami adds that extra bit of modesty for those who prefer it. Dressing up in this beauty may count as your exercise for the day, with that wrapping, but it is certainly worth it! Options – Three different sleeve lengths (short, three quarter, and long), optional extra length ties for maternity wearing, optional cami for personal preference, nursing, or modesty, and optional binding or fold over elastic (FOE) finishings for cami straps. 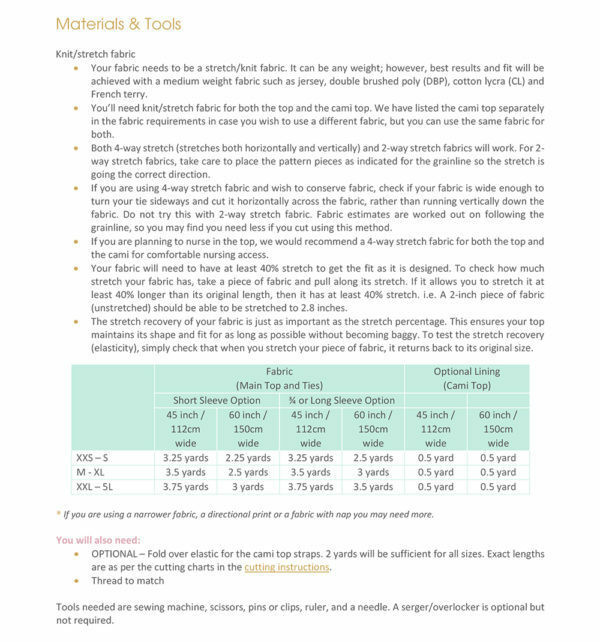 Fabrics – Suitable for stretchy knit fabrics of any weight. However, best results are achieved with a medium weight such as jersey, double brushed poly (DBP), cotton lycra (CL) and French terry. See the fabric requirements in the gallery above for yardage. A serger/ overlocker is optional but NOT required. This is a lovely pattern. The instructions are great and simple to follow and the top fits great and is very versatile. I see more of these in my future. An easy to follow instructions. It takes a while to wrap the ties but it is a comfortable and beautiful top even after wrapping many rounds round my waist. These days you rarely find a pattern that steps out of the mould, is completely original and definitely different. Well the Wrap around top is all of those things but increadably stylish, comfortable and on trend. You can make the wrap around as a normal top or as a maternity top, both look amazing on. I wore mine on a trip to Cardiff just with a pair of jeans and vans on and I felt great, because I was wearing something so unique no one had this look. The wrap around was easy to sew up, although hemming the yards and yards of belt I had to do in two batches, a coffee break was needed 😆 but I made it very quickly and without incident, the reason being was the instructions are brilliantly written and very informative. 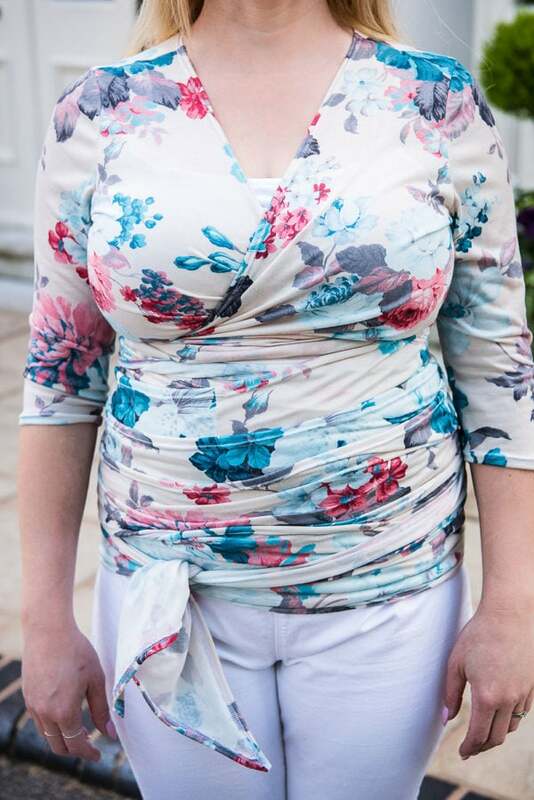 I highly recommend you have this pattern in your collection, I’m so glad I have it and whenever I need a beautiful smart top for a night out this will be my go to pattern. I absolutely love this top for pregnancy! It is super supportive and comfortable for a pregnant belly! This pattern was really easy to follow. If you are a beginner, take your time sewing the ties and you will find it easy, just time consuming to do the ties. This top comes out lovely and gives great support! Once you have tied it up a few times, tying it will become a breeze to tie up! Quick and easy sew with great instructions. Very flattering and versatile top that can be effortlessly dressed up and down to suit many occasions. Will be making more. I just love this top! You need a good dose of patience, but it is so so worth it! The end result looks classy, but feels extra comfortable. I’m currently 30 weeks pregnant, and I’m so happy that this shirt will be able to transition to non maternity once this sweet baby comes! Top was easy to construct and fit well. This was a fun top to make. It was easy to assemble the pattern, cut and sew. 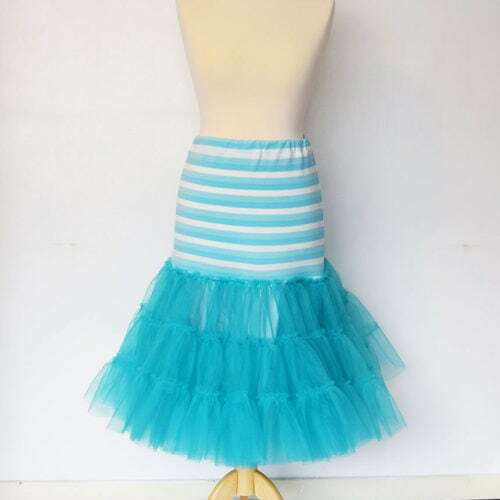 The bodice has three pattern parts and the regular wrap has only one. I wasn’t sure as I was wrapping what I would look like but I was pleasantly surprised. The wrap was flattering and made the top look more complicated than it was. I look forward to trying this with different fabrics. It was also very easy to have different bust and waist sizes. No grading was needed! I really love the simplicity of the construction on this item. It requires a lot of hemming, with the length of the ties, but it is so worth it! The wrap around top is so fun to style and is so comfortable to wear. I will definitely be making more of these for my wardrobe! Love having stylish options for maternity wear! This style isn’t one I’ve seen elsewhere and I’ve received lots of compliments when I wear it out! I loved the idea and look of this top. It’s so unique! I still think it’s very beautiful, A simple and straight forward sew. Easy to read and understand photo tutorial. Excellent true to size fit. This is a neato pattern, designed for regular wear, pregnancy, or nursing. The bust wrap is amazing (hello-lift-up! ), and you can wrap it as you like. The back bodice tucks nicely into the wrap – just make sure to hold the bodice down the first few wraps, or the wrap won’t capture the bodice.This is a rather quick sew with easy to follow instructions. And it’s a top unlike any that I’ve seen before! You can really scrap together the tie part if need be, and have a beautiful end result. What a fun and cute top! This top fits and looks adorable on all body types, as you can completely customize the fit with the wraps. I wish I’d had something like this when I was pregnant and nursing. 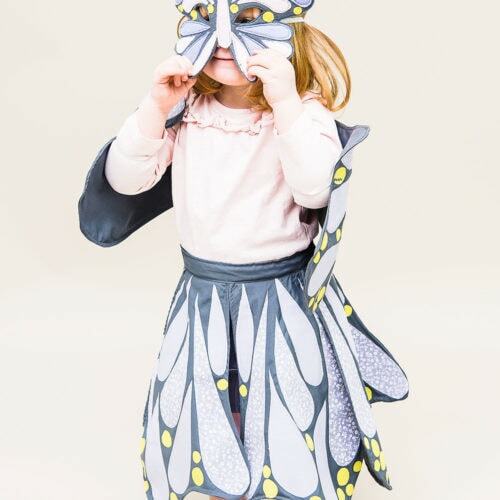 As for putting it together, the amount of hemming is a little intimidating, but don’t let that put you off – it’s worth it! Otherwise, it’s a very easy sew. I didn’t expect to like this pattern as much as I did! I am not normally a fan of wrap-type tops but this is SO fun to wear and style and well worth the sew! I made mine out of a nice french terry and it was nice, skipping the middle tie piece helped keep this cooler overall. This is a great pattern for a fun wrap around. It can go from pregnancy to post easily. You can also make it for non pregnant people and still feel secure. I love this unique maternity top! 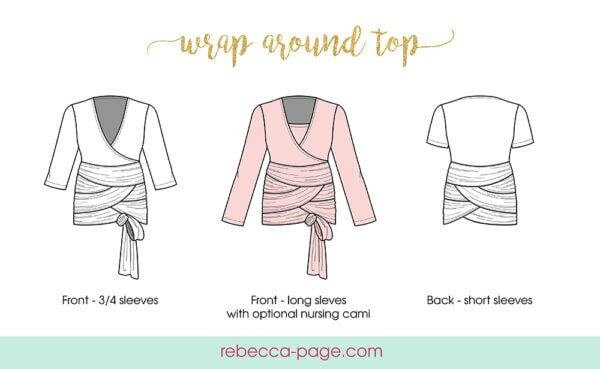 The Rebecca Page wrap top is a simple yet effective top that can “grow” as you need it to. 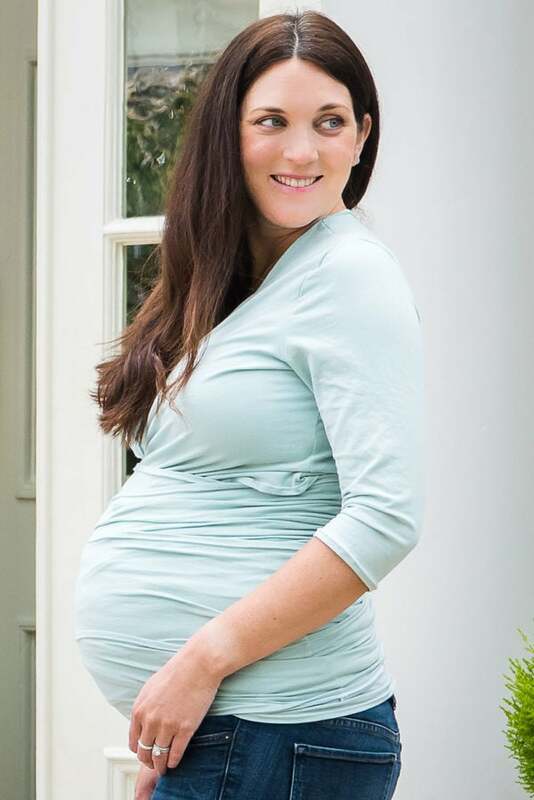 A fantastic top for maternity or post-natal, you can also wear it when you’re not pregnant. This will be a fantastic staple in the wardrobe and can be dressed up or down – wear with shorts for a casual summer outfit, or dress up over a pair of jeans or skirt for a night out! Tag your photos with #rpwraparoundtop on Instagram.